Looking for a gift that acts as a night light in disguise? Look no further than the innovative 3D deco lights by 3DLightFX! Known for their realistic 3D designs that give the illusion the model is busting through the wall, the company introduces three new TRANSFORMERS deco lights right in time for the holiday season. In addition to the TRANSFORMERS, 3DlightFX also offers an array of Super Hero, sport, nature and automotive themed 3D Deco Lights. We are loving the Football and Pink Butterfly lights in our house! These 3D sports lights from 3DLightFx add a unique accent to your home décor. Available in football, baseball, soccer, hockey and basketball motifs, these sports lights are conversation pieces. These 3D wall art lights are made of LED lights and have on/off switches. Powered by 3 alkaline AAA batteries. Assembly required. Decorate your childs nursery with a piece of natures beauty. 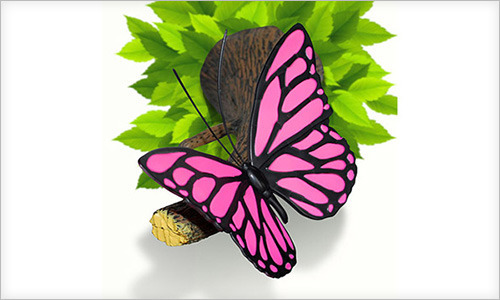 Shaped like a pink butterfly sitting on a branch with bright green leaves, this 3D wall art nightlight adds a colorful touch to the room. It gives out a soft glow to illuminate your little ones room. This 3D deco light with a LED bulb operates with 3 alkaline AA batteries (sold separately). On/off switch. Adult assembly required.